Doormat size 27" x 18"
No matter how you look at it, you're blessed! Are you walking in the blessing of God? Are you standing on the promises of God to bless your household? "Blessed shalt thou be when thou comest in, and blessed shalt thou be when thou goest out." 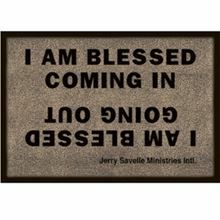 Order your doormat today and walk through a door of blessing!